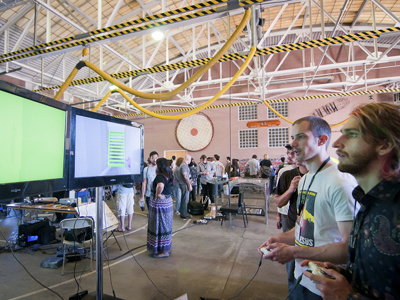 This weekend I’ll be demoing Machine of Death: The Game of Creative Assassination at IndieCade in Los Angeles! Lots of other cool games will be doing demos as well! A few of them, actually, I played for the first time last weekend at the TableFlip conference in San Francisco. At TableFlip, not only were there interesting people to talk to and a big pile of games to grab and try, the event’s speakers also each spotlighted a particular type of game in their respective talks, and then we got to play that game to learn more! I myself gave a talk about story and theme, and how that relates to game design and player experience, and I challenged everyone to come up with ways to lay a theme onto the card game War, and by doing so change the rules to align more closely with the theme. It was a bit of an experiment but people seemed to have fun! But here are the other games I played over the course of the weekend! 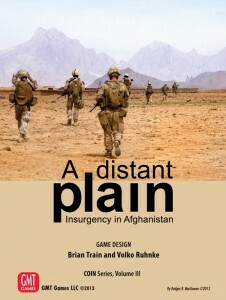 A Distant Plain by Volko Ruhnke & Brian Train. Volko and Brian are experts in wargaming with a specific focus on counterinsurgency, or COIN. They’ve explored this COIN mechanic in several games, and this one in particular focuses on the (most recent) war in Afghanistan. Players control either the Afghan government, the US-led coalition forces, the Taliban, or the unaffiliated warlords, each struggling for control and influence. Wargaming of this elaborately rendered sort is a means by which to explore the ideas and struggles behind these conflicts, not just pit armies against each other for fun. Volko & Brian’s talk focused on the challenges of building rule-based systems that attempt to accurately model the power dynamics and decision-making challenges in their respective real-world situations (their other games have focused on conflicts in Colombia, Cuba, and Vietnam, using the same core COIN mechanic). I don’t have a lot of experience with this kind of wargame, but after about an hour with A Distant Plain I started to understand both how to play, and how difficult it is to win. I’m grateful for this event, and Volko & Brian’s presentation, because I probably never would have come across this game in my daily life! The COIN games are worth checking out if you’re interested in this type of extremely elaborate wargame. But then, if you are, you probably already know all about these titles! 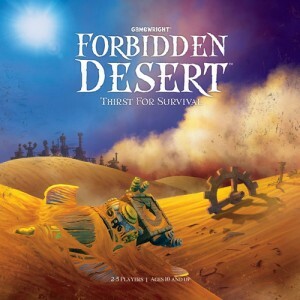 Forbidden Desert by Matt Leacock. 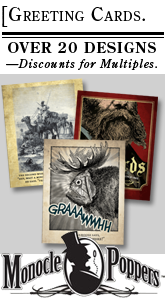 This is a followup to the cooperative escape game Forbidden Island, also by Matt Leacock (who also created Pandemic). I hadn’t played any of those until now! And now, I have played this one. It’s the only game listed here that I played twice! Our group lost the first round and immediately set out to play again — winning the second round only by the skin of our teeth. In the game, the players are a group of explorers who have become stranded in a desert near the ruins of an old city. The challenge of the game is to excavate the ruins and locate pieces of a flying machine, with which to escape the desert…before the ever-worsening storm buries you in sand, or you run out of water in the growing heat. 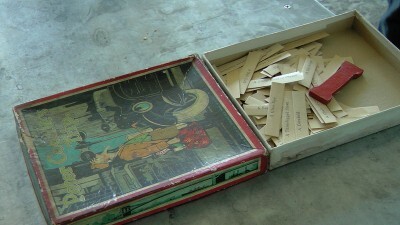 The board is made of a series of tiles, which are randomized at the start of the game so you never know how easy or hard it’s going to be to find the various things you’re looking for. Each player’s character has special skills, and working together is key! A very fun game for a group. Slap .45 by Max Temkin, et al. Max gave a talk about folk games and the power of playing in large groups, and this, like his other game Cards Against Humanity, is designed for a big group. Players each control an Old West gang, and must try and be the last person standing by shooting other players using a slap-the-deck mechanic. It’s fast paced and probably best not played slightly crouched over a not-quite-tall-enough table. 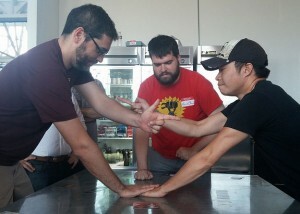 In the picture above, Brad O’Farrell (center) adjudicates the final standoff between myself and Kevin Cheng. Kevin, as you can see by his hand position, won. Hanabi by Antoine Bauza. 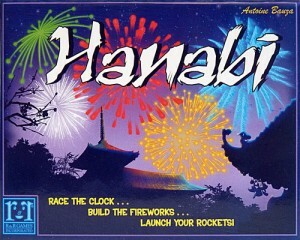 Hanabi is a beautiful card-matching game in which the players cooperate to build a collaborative fireworks display. The catch is that the players’ hands of cards face away from themselves, and the object of the game is to use limited rules of communication to try and tell the other players which cards they have, and therefore, which to play. It’s a deceptively simple game that is really quite challenging! Scoundrels by Randy O’Connor. 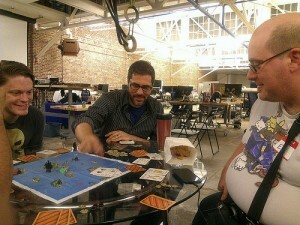 This was a game that Randy (just out of the picture, at left) was playtesting at the conference. He made it out of pieces from another pirate game, and added his own game map and swashbuckling cards. It’s a steal-the-loot, shoot-your-enemies game that’s pretty fun, made better by the fact that Randy himself made a last-move wager that lost him the game catastrophically, in a very dramatic turn of events. His website has an email list for updates once the game moves out of testing. 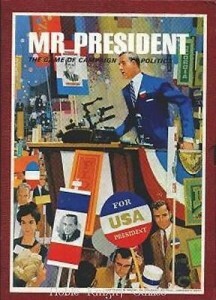 Mr. President: The Game of Campaign Politics by Jack Carmichael. One of the attendance perks of TableFlip was a “swag-bag” giveaway of old 3M “bookshelf series” games, including this 1967 political campaign game. I gave it a play and was surprised to find it pretty fun! There is some strategy in trying to outmaneuver your opponent for votes, and counting up the ballots at the end is a neat kind of nerve-racking. It’s clear that this game is pre-Nixon and pre-Southern Strategy, as the manual asks whether you can break the Democratic stranglehold on the South, or the Republican grasp on California. The presidential candidate avatars that you can choose from are pretty cheesy 1960’s WASP men, so playing this game with a certain Mad Men-level of detached postmodern irony is possible as well. 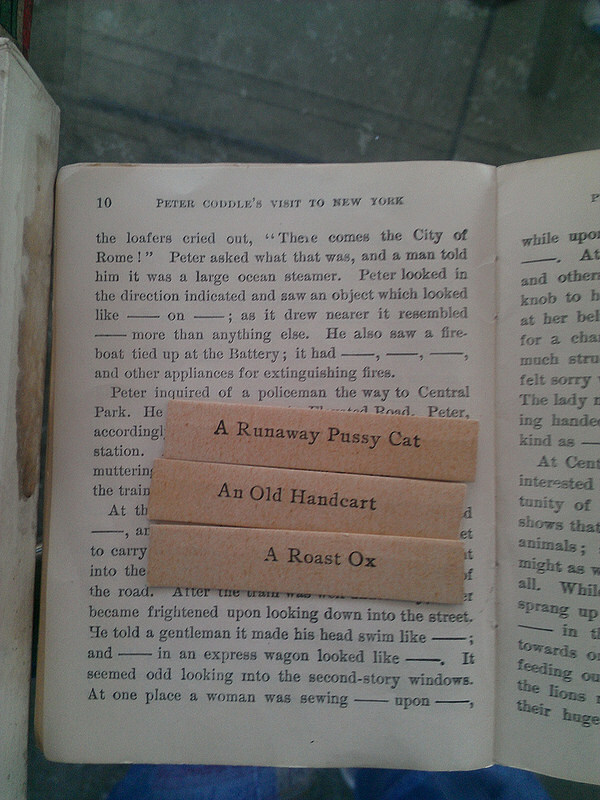 Max Temkin showed off this amazing turn-of-the-century party game that I’d never seen before. It’s basically Mad Libs married to the improv game Blind Line — in other words, it’s Mad Libs except that you don’t make up the blanks in the story, but instead insert a random slip of prewritten text. It’s not really a game — you can’t win or lose — but I love it anyway. 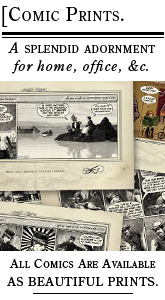 It was reissued multiple times over the first few decades of the 20th century (with revisions, one wonders?). It’s the sort of thing that you can try to ape nowadays, but you’ll never, in the modern day, think to include a slip reading “A three-legged stove” or “A hod of coal”. Copies, of course, are on eBay. 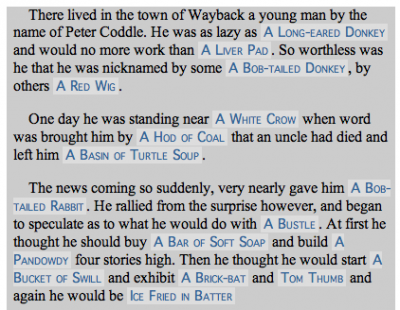 Or, randomly generate your own Peter Coddle story, thanks to the fine people at this website I just found via Google! It’s probably too easy to say that the modern version of this game/activity/amusement would be putting Cards Against Humanity cards into a Mad Lib. 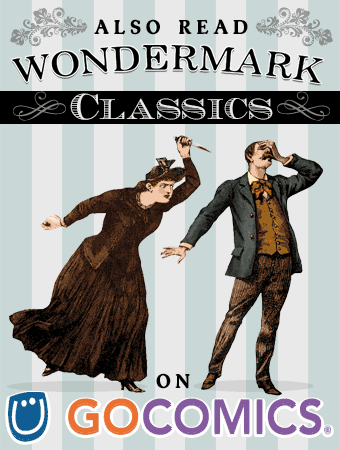 Yet I find myself wondering if there is a better modern-day adaptation of this that could retain what to us, nowadays, reads as period charm. This was a very simplistic product, but was clearly extraordinarily popular. Probably because there was no way to mess it up? Here’s my updated version of Peter Coddle’s Visit to New York: Take any article from the New York Times and replace every noun with the one immediately following it in the dictionary. 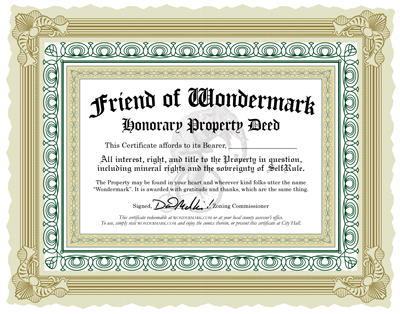 This entry was posted on Thursday, October 9th, 2014 at 11:45 am and is filed under Blog. You can follow any responses to this entry through the RSS 2.0 feed. Both comments and pings are currently closed.